As well as being a long-serving sportswriter for, amongst others, The Sunday Times and the Guardian, Rob Steen has also become a prolific writer on sports including cricket and football. 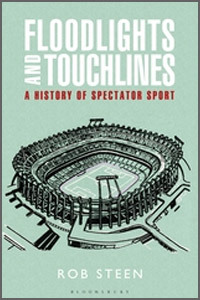 This 531 page tome on spectator sports from its origins to what it has become today to many armchair enthusiasts and supporters in the stadia alike shows that his knowledge of sports including cricket, football, baseball and tennis, amongst others, is most impressive. The book is illuminating in that, to my knowledge, not many books have been written about spectators. Richard Cashman once wrote a book which included Indian cricket crowds and Derek Birley a social history of English cricket but this book has all the makings of being the book to read on the subject. Witty and with an easy style, Steen takes us through the ages - indeed mentioning presumably the earliest known example of spectator sports, the Romans and the gladiators - through to the present day with his knowledge and I am sure that I will not be alone in being impressed by it. What is it about sport that makes spectators and supporters go to extreme lengths? People have rioted and committed suicide and the well-known and "illustrious watcher of mankind", Desmond Morris, even wrote a book about football called The Soccer Tribe as well as becoming a vice-chairman of Oxford United. Any number of subjects covering people's emotions, how and where the game can be watched and followed are covered. Many more people watch sport than those actually in the stadia but examples of a full house being good for the television coverage are given. Naturally, with sport not only being a major business and the stakes becoming ever higher, not everything is as pure as it might be and subjects like match-fixing and cheating naturally feature. Sport and Politics alone has a chapter of over fifty pages devoted to it and the tricky subject of race and sexuality appears in detail all adding to an extremely well-rounded and insightful coverage of spectator sport. Ever wondered why some of us get so het up over adults knocking, in most cases, balls about? In my case, it was, on one occasion, watching adults driving fast cars at the denouement of a Formula 1 season. Having read Floodlights and Touchlines, I can see now that my behaviour wasn't that extreme. We have heard of sport referred to as being not a matter of life and death as it's far more important than that but, for a greater insight into the world of spectator sports, this is the book to read.